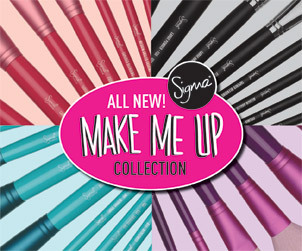 Introducing the new Sigma Beauty 'Make Me Up' collection! Our best selling professional 12 brush kit now comes in beautiful colors and inside a durable and multifunctional container! Besides protecting your brushes, this exclusive container transforms into 2 stylish brush holders! 12 professional quality brushes for a complete makeover! Everything you need to apply makeup to eyes and face. For $99, You can get this kit and all its goodness for you to use and keep. I'm glad Sigma has 4 different colors to choose from and still included the classy black in as well. The packaging is bright and happy! I love it! Even the brush handles are colored to match the case. Get your pick now before its sold out or taken off the site. Free Gift??? If you order this kit! Sigma is also including a free travel sized E25 brush with the kit. The kits can be ordered online at Sigma Beauty! The packaging is totally cute! But to be honest there are some MAC brushes I prefer over Sigma ones. I bought one of their sets before but still end up buying MAC brushes every now and then. regarding your Zoya question.. it was actually a surprise when I got my package in the mail.. Online, the order still states that it has not been shipped yet, and even gives me the option to cancel my order =S i ordered towards the end of the promo.. hopefully you'll get yours soon. my sister also ordered and didn't get her order yet..